Check in and out was smooth and easy. Please note there are two flights of stairs that are quite steep to get to the main level. Beds were comfortable but we could have used a spare blanket or two as it was cold during our stay. The kitchen was well equipped. But there were several dead light bulbs that made the kitchen/dining area tough to cook in at night. Finally, the CO detector went off two nights in a row. Quite unnerving, but we were told the apartment had electric heat so there was nothing to worry about. We stayed here for 1 night while visiting Boston for a birthday and was very nice. The pictures make it seem like your renting the whole house but its really just the third floor and a small room on second floor. Everything was clean and nice the only problem we had was the alarm system. Every-time we would walk down the hall it started beeping loud and a voice you could not understand started coming from it yelling. It also happened during the night when we were sleeping. Could not diagnose the problem as we couldn't understand what it was saying. Overall great stay though. We had a great visit. 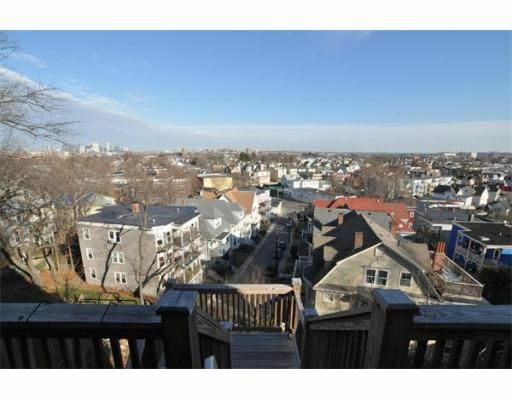 The property is very spacious and within easy reach of Boston via the T, Uber, etc. Property is well located within walking distance of railway and shopping. The view is amazing and the street is quiet and peaceful. Only comment for management is when weather turns cold, provide adequate warm bedding and turn on the heating prior to guest arrival - they were responsive to our request to remedy these problems. We did have an outstanding stay in Boston! The house is close to everything in town! We didn&#x2019;t hear the neighbors. The neighborhood is calm and lovely. We will strongly recommend you to our entourage. Beautiful views of Boston. Lots of stairs and harder for older adults. The T was 10 blocks away, not bad. Lots of wonderful restaurants and CVS right around the corner 3 blocks away. Central heat and window unit ACs. Apt was clean..needed extra sheets for futons in living room and one of the bedrooms. Loved it! !